Several thousand messenger RNA molecules can be found in cells. These molecules carry copies of DNA’s genetic instructions to the other areas of the cell. A team of MIT researchers have formulated a method to visualize these molecules in better resolution than formerly possible in whole tissues, thereby allowing scientists to precisely map the location of RNA all through the cells. The core aspect to the novel method is expansion of the tissue prior to imaging it. By increasing the physical size of the sample, it can be imaged with very high resolution using common microscopes found in research labs. 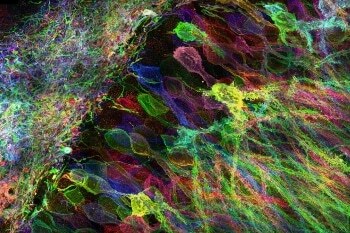 “Now we can image RNA with great spatial precision, thanks to the expansion process, and we also can do it more easily in large intact tissues,” says Ed Boyden, an associate professor of biological engineering and brain and cognitive sciences at MIT, a member of MIT’s Media Lab and McGovern Institute for Brain Research, and the senior author of a paper describing the technique in the July 4 issue of Nature Methods. Researching the RNA distribution within cells has the potential to assist scientists understand more about the way cells control their gene expression, and also allow them to examine diseases believed to be caused by breakdown of RNA to move to the proper location. Last year Boyden and colleagues initially illustrated the fundamental method, referred to as expansion microscopy (ExM), when they applied it to image proteins within large samples of brain tissue. The MIT team’s recent work has been published in Nature Biotechnology where they have described a new version of the technology that utilizes off-the-shelf chemicals, which makes it simpler for researchers to adapt. The innovative expansion microscopy method involves embedding tissue samples in a polymer that expands when water is added. Enlargement of tissue allows researchers to attain images with a resolution of roughly 70nm, which was formerly possible only with highly specialized and costly microscopes. However, that technique had some hurdles such as requiring production of a complicated chemical tag comprising an antibody that targets a particular protein, connected to both a chemical anchor and a fluorescent dye that attaches the entire complex to a very absorbent polymer called as polyacrylate. After the targets are labeled, the team broke down the proteins that held the tissue sample together, enabling it to expand evenly as the polyacrylate gel swells. In their recent studies, to do away with the need for custom-made labels, the MIT team used a diverse molecule to fasten the targets to the gel before digestion. This molecule, which the researchers christened as AcX, is commercially available and thus ensures that the process is much easier. AcX can be changed to fasten either RNA or proteins to the gel. In the Nature Biotechnology research, the team used it to fasten proteins, and they also demonstrated that the method works on tissue that has been formerly labeled with either proteins such as green fluorescent protein (GFP) or fluorescent antibodies. This lets you use completely off-the-shelf parts, which means that it can integrate very easily into existing workflows. We think that it’s going to lower the barrier significantly for people to use the technique compared to the original ExM. Using this method, the time taken to scan a piece of tissue 500 by 500 by 200μm with a light sheet fluorescence microscope is roughly one hour. The MIT researchers demonstrated that this method can be used for several types of tissues, including brain, lung, pancreas, and spleen. In the Nature Methods paper, the team applied the same sort of fastening of molecule but tweaked it to target RNA instead. All of the RNAs in the sample are fastened to the gel, so they remain in their original locations all through the digestion and expansion process. Following tissue expansion, the researchers label particular RNA molecules using a method called fluorescence in situ hybridization (FISH), which was first formulated in the early 1980s and is extensively used. This enables researchers to visualize the location of particular RNA molecules in three dimensions, at high resolution, and in large tissue samples. This improved spatial accuracy could facilitate scientists to investigate several queries relating to how RNA impacts cellular function. For instance, an ancient question in neuroscience is how neurons quickly modify the strength of their connections to store new skills or memories. One theory is that RNA molecules encoding proteins essential for plasticity are contained within cell compartments close to the synapses, ready to be translated into proteins when required. With the innovative system, it should be possible to establish precisely which RNA molecules are found near the synapses, ready to be translated. People have found hundreds of these locally translated RNAs, but it’s hard to know where exactly they are and what they’re doing. This technique would be useful to study that. Boyden’s lab is also keen on applying this technology to outline the connections between neurons and to categorize different subtypes of neurons according to which genes they are conveying. The study was funded by the Open Philanthropy Project, the National Institutes of Health, the New York Stem Cell Foundation Robertson Award, the National Science Foundation, and Jeremy and Joyce Wertheimer.